Insurance is one of those things that nearly everyone has, but almost no one understands. When it comes to homeowners, the bank holding the mortgage insists on homeowner’s insurance to protect their investment. When it comes to motor vehicles, all but three states compel drivers to carry auto insurance. Fifteen of those require more than simple liability insurance and insist on personal injury protection, as well. So, it only makes sense that if drivers or homeowners are required to buy insurance, the insurance company should be there when the policyholder needs them. The agreement is simple. The vehicle (or property) owner pays a premium in exchange for the assurance that, when a claim needs to be filed, the insurance company will pay it. If your insurance company has not followed through for you, it may be an act of bad faith. Our Denver insurance lawyers are here to help you if your coverage has been denied or delayed unlawfully! Fill out a free case evaluation form now to find out how. The agreement between parties is one of many duties the insurer has to the insured. A first-party claim is straightforward: under a policy written on the property that becomes damaged, whether it is a house, a car, or even a person the insurance company must investigate that damage, decide whether the policy covers the damage, and (if so) pay the policyholder. If the insurance company fails to investigate a potential claim, calculates the claim value improperly or denies the claim outright, they are acting in bad faith and Burg Simpson’s bad faith insurance lawyers personal injury lawyers out of Denver can help. But you need to contact us before it is too late in the process! •	Unjustified denial of coverage. •	Failure to communicate relevant information. •	Failure to conduct a reasonable claim investigation. •	Claim refusal without investigation. •	Undue delay in denying or paying a claim. •	Undue delay in confirming or denying coverage. •	Failure to attempt to come to a fair and reasonable settlement when liability is clear. •	Offering substantially less money to settle than the true value. •	Undue delay in providing a sound explanation for claim denial. •	Failure to enter any claim settlement negotiations. •	Failure to respond to a time-limit demand. •	Failure to disclose policy limits. Another duty insurers have to policyholders is called indemnification. Simply put, this just means the insurance carrier must defend any suit or judgment entered against the insured. The insurance company has a duty to defend any claim that could potentially fall with the policy coverage. Additionally, courts have ruled that an insurer “who fails to accept a settlement within the policy limits by not giving the insured’s interests as much consideration as its own, is liable for any resulting judgment against its insured,” even if it exceeds policy limits. Bad faith, then, can occur when the insurer either fails to pay the judgment or improperly defends the lawsuit that leads to it. A Denver injury attorney can help guide you through so nothing is missed. SO WHAT CAN I DO IF MY INSURANCE COMPANY ACTS IN BAD FAITH? Do not think this can’t happen to you. Since insurance companies are all about spreadsheets, all they have to do is run the numbers and that will typically decide whether they will pay your claim or make you fight for it. If the math says it is more expensive to pay, they will deny your claim, delay your payment, and defend any lawsuit you file or all of the above. Nevertheless, insurance companies operating in Colorado are required by law to act in “good faith and fair dealing,” including, among other things, investigating claims quickly and thoroughly, paying claims promptly, and communicating with policyholders openly about claims. An insurance company that fails to meet its obligations under the law may have not only acted in bad faith but breached its contract with the insured, as well. This is not right and Burg Simpson is here to help you with this complicated situation. If you think your insurance company has acted in bad faith, you may be entitled to compensation. Under Colorado law, insurance companies may be responsible for up to three times the benefits owed, interest, as well as attorney’s fees and costs. Punitive damages may be awarded, as well. In fact, judges and juries are typically eager to hand down large punitive penalties in bad faith cases. Although damages and damage types can vary wildly by state, other potential damages can include statutory penalties and interest, judgments that exceed policy limits, damages for emotional distress and economic loss (which can include physical as well as reputational losses). WHAT CAN I RECOVER IN MY PERSONAL INJURY CASE? •	Breach of contract. Strictly speaking, breach of contract is any violation of agreed-upon terms and conditions in a binding contract. In this case, an insurance contract means the insured client agrees to pay a regular premium in exchange for a promise that the insurer will cover any claim. •	A tort claim, in addition to the original breach of contract claim, allows policyholders to recover up to two more times the amount of the benefits owed. •	Attorney’s fees can be set as a flat rate or established on a contingent basis. •	You also may be able to recover damages for mental and emotional distress. These are economic damages designed to compensate a plaintiff for psychological suffering as a result of an injury. It does not matter if the injury was intentional or occurred as a result of negligence. •	Finally, punitive damages may be applied as a deterrent and to punish the insurance company for its bad conduct. As a result, these can typically greatly exceed typical policy limits. ARE MOTOR VEHICLE INSURERS REQUIRED TO ACT IN GOOD FAITH? Uninsured Motorist (UM): is a provision which provides drivers damages for any injury he or she receives from an uninsured, negligent driver. After a qualifying incident, the insurer pays the difference between what the uninsured driver can pay and what the injured driver would be entitled to as if the motorist had proper insurance. Underinsured Motorist (UIM): is a provision that allows a victim to receive compensation after an accident with an at-fault driver whose liability limits are not adequate to cover damages and medical expenses. Your insurance will cover the gap between the expenses and what the at-fault driver's insurance will typically pay. Medical Payments (Med Pay): is a provision that provides immediate and necessary medical services following a car accident that results in injury. Also, if you are in a car accident and a claim is brought against you by the other party, your insurance company typically has a duty to defend you and settle claims brought against you without exposing you to out-of-pocket financial losses. 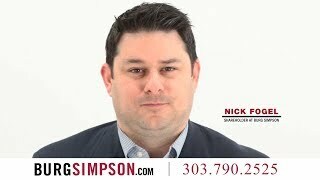 A Burg Simpson Denver injury attorney has the experience and resources to handle bad faith insurance claims against car insurers. WHAT ABOUT HOMEOWNER’S INSURANCE? HEALTH INSURANCE? Other insurers, including, homeowner, renters, health, and disability insurers may be liable for their bad faith actions in handling claims. However, bad faith claims brought in health or life insurance cases can sometimes be prevented by ERISA. ERISA – the Employee Retirement Income Security Act of 1974 – is a federal law that establishes minimum standards for most voluntarily established pension and health plans in private businesses to provide protection for plan participants. ERISA does not require employers to establish a health plan for its employees, but it does regulate its operation if an employer decides to launch one. It is complicated. There are a lot of rules, exceptions, and variations in this area of law. Burg Simpson’s Denver personal injury attorneys have the experience and resources to navigate this complicated landscape and pursue insurance claims against insurers who act in bad faith. If you are frustrated with the way your insurance company is treating you after you filed a claim – whether it involves a motor vehicle accident, a house fire, or a disability – you have every right to fight for what you are owed. Bad faith lawsuits can be exceedingly complex and require the expertise of insurance attorneys who have years of experience handling hundreds of these types of cases. These types of personal injury cases can also result in large damage rewards, often because of generous punitive damage rulings. One of the better-known examples is a 2001 U.S. Supreme Court case, State Farm Mutual Auto. Ins. Co. v. Campbell, which overturned a $145 million jury verdict against State Farm Insurance. Bad faith cases can be slow, tedious endeavors, too. That is because any underlying legal proceedings often have to be resolved first. The 2003 Campbell decision took more than two decades to reach its conclusion. 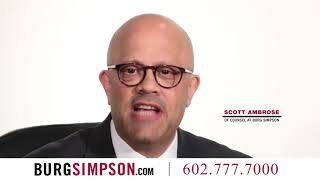 Burg Simpson can help. We have decades of experience handling these sorts of intricate cases. We have an unmatched reputation in the legal community. We also have the resources to overcome the deep pockets of insurance companies to secure your benefits, negotiate, and settle bad faith claims. 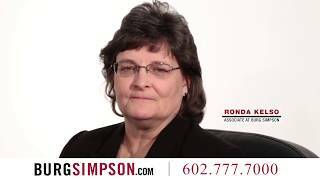 If need be, Burg Simpson can battle your insurance company in court if they will not settle. Each of our bad faith insurance attorneys at Burg Simpson has helped many other consumers in Colorado receive the insurance benefits they deserve and recover compensation for the bad faith actions of their insurers. Call us today at 303-792-5595 or fill out a free case evaluation form here for help before it’s too late.